Colombia edged through as leaders of the tight group H, where no team stood out from the crowd. All was to play for as Poland’s victory against Japan opened the door for Senegal to qualify needing just one point from the final game. And had Mina not got the better of his marker on the corner, they would have done in what was a good performance by the African side. With the pace of Mané, Niang and Keita, Senegal often tried to play in-behind Colombia’s defensive line – both in sustained possession and in transition. The front four were often very wide – with the ball-far winger staying close to the touchline – presumably to stretch Colombia’s defensive line and increase space for runs into channels. In transition, the two forwards’ immediate trigger was to attack the space on the side of each centre-back, in what was an obvious strategy. During possession through Senegal’s right side, the left-back would occupy very high positions alongside the already wide Baldé Keita, as they looked to play long diagonals. The defensive orientation of Cuadrado – who stayed deep and disconnected from his midfield – seemed to suggest that this was expected by Colombia as the winger focused on Sabaly. Because of Senegal’s predictability, Colombia could anticipate the pass comfortably. The defensive line were quick to drop, because there was minimal danger of a forward coming short to receive between the lines, and Colombia’s centre-backs were rarely stretched vertically. In that sense, more diverse movements of Senegal’s front four could have aided their efforts. 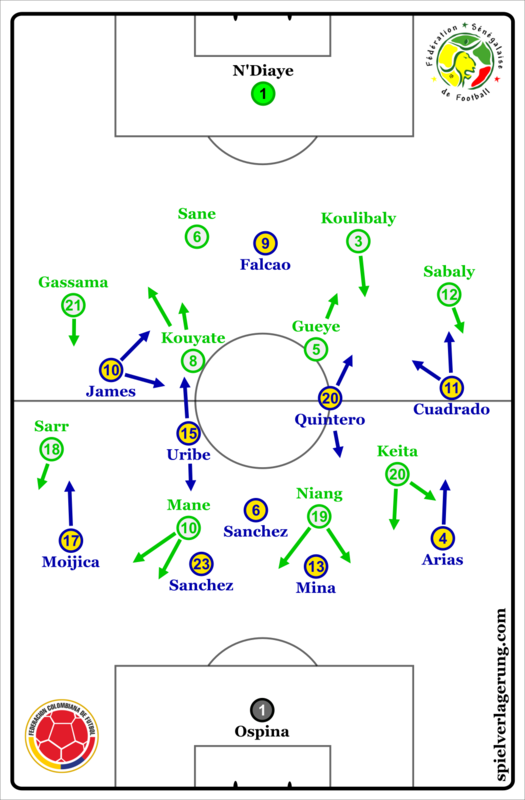 The most notable element of the game was the contest between Senegal’s midfield press and Colombia’s efforts to play through it. Senegal defended in a 4-4-2, where the two strikers were focused on covering passing lanes into central positions and tried to shepherd their opponent to play towards their full-backs. Upon this trigger, the wingers would step up aggressively and look to create duels with the sixes in a good, ball-oriented position to cover. The aggressiveness of Senegal in wide areas often forced turnovers from their South American opponents, with the pressure often forcing the full-back into a poor decision. If Colombia wanted to try and play through the pressure, which I assume they did, then their six should have been more active in offering to receive a pass into midfield. Although he was covered well in central areas by the two nines, he rarely shifted into the half-spaces to provide an extra passing option for the full-back – who was often just left with the ball-near eight and the winger as possibilities to play forwards – both of whom were covered by Senegal’s ball-near six and full-back respectively. At the very least, it would have given Senegal’s ball-near nine the dilemma of whether to drop to cover the six, or to stay high and cut-off the backwards pass to the centre-back. The degree of an opposing team’s pressure is relative to the amount of passing options the ball-carrier (and then the subsequent ball-carriers) has. By creating more options, you increase the amount of accessible space and in-turn reduce the opponents’ access to press you. By providing the full-backs with just two (weak) options to pass to, Colombia made it far too easy for Senegal to apply pressure. Credit to the defending team though. 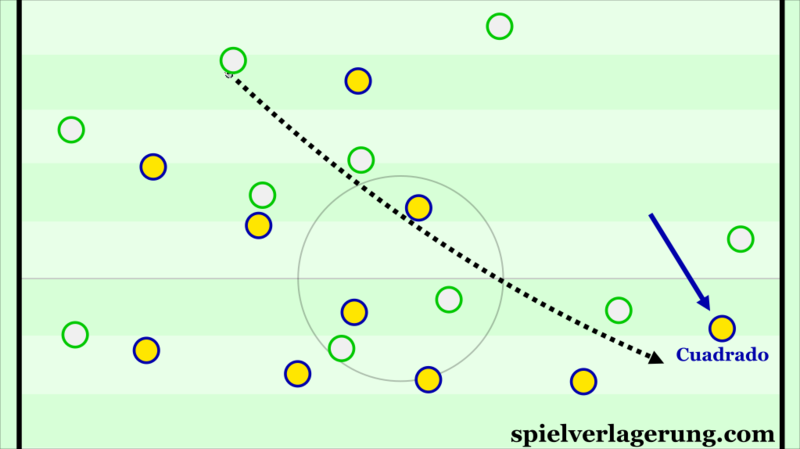 They intelligently stepped up with good timing – just as the pass is made – while their sixes occupied ball-oriented positions to block inside passes. As the game progressed, and after Muriel replaced James, Colombia began to play more direct as their efforts to play through Senegal’s midfield press were failing. Muriel, playing higher and more central than James, would look to use his pace with in-behind runs, while Cuadrado became less focused on receiving to feet, and would also attack the space behind Senegal’s defensive line. A common pattern was switches from left to right made by Uribe, who dropped towards the centre-backs, to Cuadrado who stayed wide. Though this wasn’t particularly successful due to the distance/difficulty of the pass while Sabaly was quick to press Cuadrado on receiving the ball. The strategic change was a pragmatic choice, and one that benefited the South Americans defensively more than offensively. It reduced the risk of their opponent transitioning from the half-way line (although they still had some dangerous moments when counter-attacking from deep), and they avoided the duels which Senegal created so well in the first half. If they were to lose the ball when playing direct, then they had more numbers between the ball and their goal, and could generally counterpress with stability. With the loss, Senegal missed out on qualification to the knockout rounds on fairplay, while Colombia face England. The African side can feel harshly done by, after a performance deserving of a draw in a narrowly-contested game. Southgate may be encouraged by Colombia’s poor display in possession, and it will be interesting to see if the side maintain their more direct adjustment going forwards in the competition.